You will be transferred to the airport for a flight to Lhasa. However, this remarkable flight last only an hour while crossing the Himalayan range.As you may expect the striking mountain views surround you the entire time. Once you arrive at Lhasa Gonggar airport, an easy one hour drive will take you to your destined final destination of the traditional Hotel (60km). Remainder of the day can be spent relaxing and exploring some of the many sights in Lhasa O/N Hotel. Haven’t you always dreamt of visiting the ancient Tibetan monasteries?Our knowledgeable English speaking guide will show you everything there to see in some of these renowned sights. In the morning we will be spending our time exploring the Jokhang temple and Norbulingka. The Norbunglinka is another astounding piece of architecture and was once the summer palace of the Dalai Lama. Jokhang Temple will provide you one of your first sights of devout Tibetans, as hundreds visit this sacred shrine each day. The central market of Lhasa, the Barkor, surrounds the Jokhang Temple. In these cobbled streets you can experience more Tibetan culture and even purchase some amazing crafts. Afternoon we will explore the beautifully preserved Sera Monastery. Many of the pictures you see of Tibet are of these buildings with their white washed walls and golden roofs. To this day several hundred monks live and study in this architecture. O/N Hotel. Day 03; Further Exploration of Lhasa. To explore some of the ancient quarters of the Dalai Lama we will visit Potala Palace in the morning. Be prepared for astonishment as this grand palace has been around since before the 17th century. It is a vast building with much to explore. 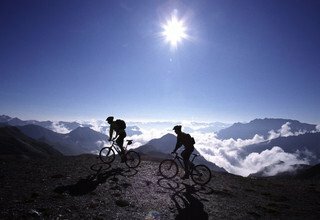 Those who wish to do so can ride their bikes around the city for the first time O/N Hotel. 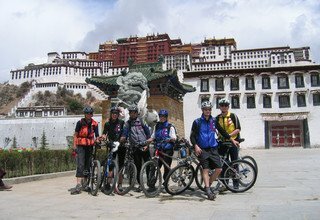 Day 04; Lhasa, our first day on bike. 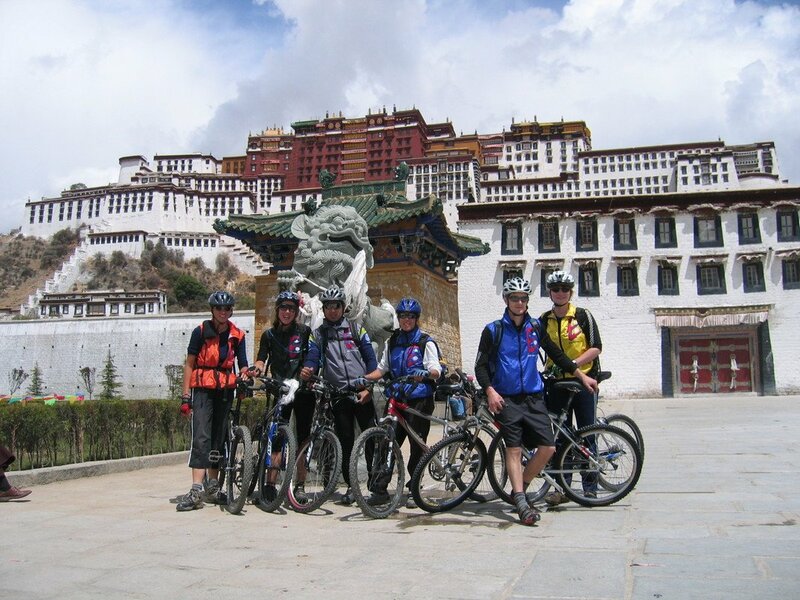 Our fourth day will be another easy one as we cruise around Lhasa on our bikes. Both the Sera and Drepung Monastery will be visited for another taste of Tibetan culture. To add even more history and culture we will also visit Drepung Monastery. Once home to over 10,000 monks,the Drepung Monastery is still a beautiful sight to see. Miraculously it was one of the few sights to escape the Cultural revolution without widespread damage. O/N Hotel. 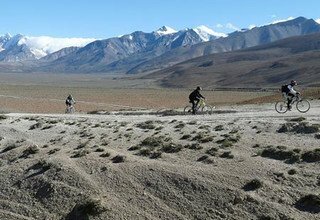 Day 05; Lhasa to Chushol 3994m, 65km. Our life changing journey officially begins today as we pack up the trucks and prepare for departure. It is essential that we take only what we need with us. Our first stage to Chushol is fairly level and easy. We will ease you into the journey so it is even more enjoyable for you O/N Camp. Day 06; Chushol to Yamdrok Lake 70km (4360m). Our first major pass is encountered today as we cross Khamba La 4970m and there are 23km from bottom to top. We will take the pass slow and even hop in the trucks if necessary as we are all not acclimatized yet.The views form the pass stretch out for miles and miles. We are able to see numerous rivers and the turquoise waters of Namdrok Lake. The night will be spent at a campsite below the lake after descending the pass. O/N Camp. Day 07; Yamdrok to Karola pass (5010m) 67km. 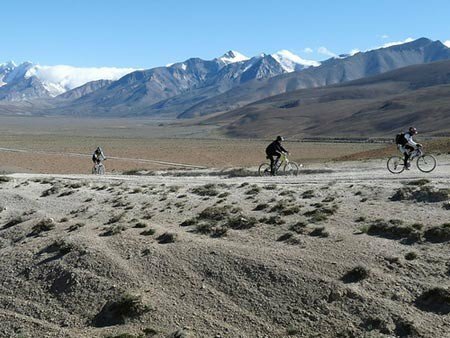 Biking from Yamdrok Lake to Karola pass, which is our camp near the Mt.Nye Jing Kang Sang, because we will see the very nice view of the glacier, which is completely snow covered. O/N Camp. This is another fairly easy day as we cruise down hill to Gyantse. While in Gyantse we will visit man historic sites. The sites range from ancient military forts to beautiful monasteries. The Kumbum monastery, a large gold roofed stupa, has much to explore in its intricate buildings. Even if you are not an art connoisseur you will appreciate the wondrous murals to be found in this monastery. We will spend the night in the hotel. Relax and enjoy the hot showers O/N Hotel. Our destination, shigatse is 94 kilometers away. If we want to reach it before nightfall we must get in our back up vehicles. Dont worry though;all of the beautiful sections of this stretch will be viewed on bicycle. After finally reaching Shigatse we will spend the night in Gang Gyen hotel or similer. O/N Hotel. Today will be spent exploring Tibet's second largest city! There is much to see in this town, but the highlight for most is our visit to the Tashi Lhunpo Monastery. High walls surround this intricate maze of shrines, prayer wheels, rock inscriptions, and Tibetan pilgrims. Excellent views are seen once again from the top of the Shigatse fortes. Once again we will spend the night at Gang Gyen hotel or similer. O/N Hotel. Today we head towards our third major pass, Tso La (4657m). We must ride for 75 kilometers before we reach our final campsite before the pass.O/N Camp. 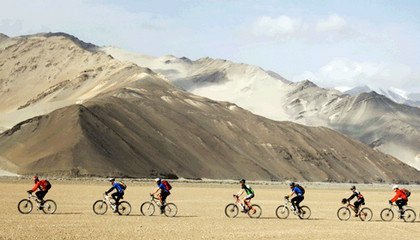 Day 12; Cycling from bottom of Tsola to Gyatso la pass (5220m) via Lhatse town 90km and we will set up camp at (4660m) before the highest pass Gyatsola. O/N Camp. (Sakya monastery if group need off road and visit monastery). On our thirteenth day we cross yet another pass, Gyatso La (5220m) and here are 24km from bottom to the top. Our night will be spent at just before the Everest check post, only a few kilometers away from the main road and our path to Rongbuk valley. O/N Camp. Today we must climb a steep 18km to get the top from our campside. We will spend the night in a small settlement on the south side of the Tashizom villige. Along the way, wondrous views of Makalu, Everest and numerous other peaks can be seen from the top. O/N Camp. Our route splits off to the south as we encounter Phadruchi, a decently sized town after the pass. 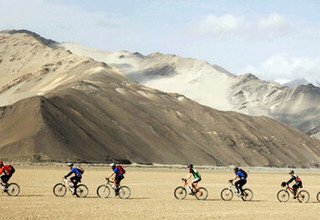 The majority of today's ride is on flat land as we head towards Rongbuk. However, we must climb a steep 10 kilometers before we reach Rongbuk Monastery. It is such a relief to see Everest come into view as we end this long day. O.N Camp. Today is a much needed rest and sightseeing day in Rongbuk. We will explore the numerous destroyed and revitalized monasteries which inhabit this high altitude area. What a historic and moving sight they are! The Everest base camp lies only 8km from Rongbuk monastery. O.N Camp. Today is an amazing today as we cycle to Tsamda via Old Tingri and end our day with a dip in the natural hot springs. It is a quiet yet beautiful countryside. O/N Camp. Today we cycle towards our last and one of the highest pass of the trip,Thong La, and we will camp at Lalung. O/N Camp. Today is another challenging day as we cross this amazing pass Lalungla(5150m)there are only 7km to the top. We are all in excellent shape by now. But from that top to Nepal is one of the longest down hill in the world and we will camp just after the Nyalam. O/N Gusthouse or Hotel. Day 20; Nyalam to Border 27km. 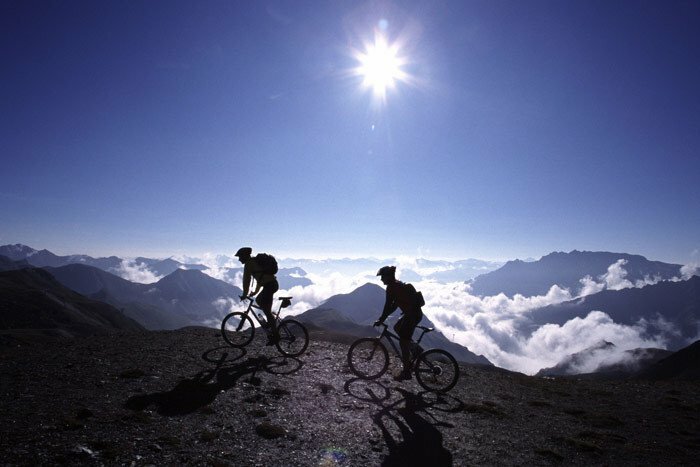 Finally we are able to cruise nearly 4600 meters downhill! What an adrenaline rush as today we head towards the Nepal border. 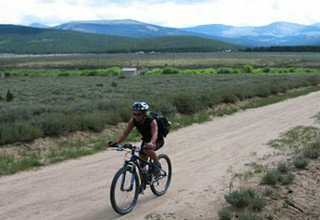 Our easy ride down is complimented with beautiful scenery along the way. After going through the border we set up camp in Nepal.